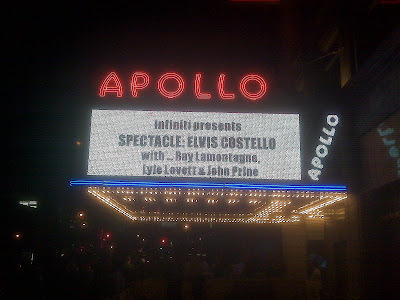 Lucky enough to land a pair of free tickets, Shana and I attended tonight's taping of "Spectacle: Elvis Costello With..." at the legendary Apollo Theater. (Is it possible to mention the venue without appending the word "legendary?") We showed up early at the front of the line and easily grabbed great seats in the 5th row of the center orchestra with a view right in front of the interview chairs. This episode featured three American folk singer-songwriters: elder statesman John Prine, Lone Star slinger Lyle Lovett, and the young old soul Ray LaMontagne. The format of the evening went as follows: Costello played a short solo set, then he brought out each artist individually for two songs solo followed by an interview segment then by a third song (either with or without Costello), and to finish, all four men got on stage as a group for two last songs. Musically speaking, the selections were pretty delicious with many highlights. To kick off the evening, Costello opened with two oldies from his debut album, My Aim Is True -- "Poison Moon" and "Wave A White Flag" solo on guitar. Prine, whose music I've heard covered by other artists, sang two songs that were lyrically complex, yet different in style -- "That's The Way The World Goes 'Round," which was amusing, and "Lake Angela Marie," which was quite poetic. Lovett sang wonderfully, including a new unreleased tune which he claimed he wrote while watching a football game that had a funny beer commercial next to a news segment. Third came LaMontagne, who opened with a rousing stripped-down solo acoustic version of the radio-friendly "You Are The Best Thing" with a different arrangement, and then his "Jolene." Finally, the men played "Loretta" by Townes Van Zandt and Prine's "Angel From Montgomery." 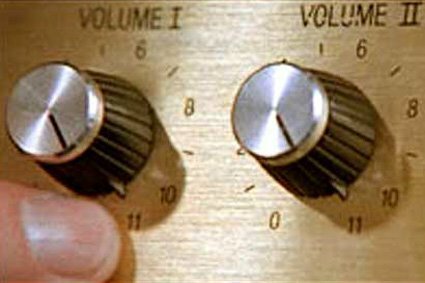 In total, we heard 14 songs, with a few repeats. Interview-wise, I thought the success varied with each guest. Overall, I'd say Costello is a compelling host, obviously full with his own stories and geek trivia. When Prine was in the chair, Costello showed great deference and allowed Prine to tell some amusing stories. I can see why Prine is viewed with tremendous respect by many musicians. However, when Lovett sat for a conversation, it really became the Elvis Costello story-telling hour with little input from Lovett, who seemed like a perfectly capable and nice guy. Shana suggested that it was the Texan gentleman in Lovett, who was too polite to interrupt Costello, who'd ask a question, and as Lovett got out a sentence, would then hijack the conversation with his own story over and over again. With LaMontagne's segment, Costello had a bit more success than with Lovett, as LaMontagne seemed reluctant to embrace any kind of attention, so Costello had to coax him out some. I quite enjoyed LaMontagne's deadpan retort, when asked if he hated people -- "No, I love people. 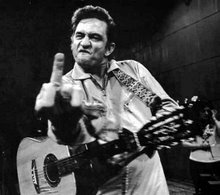 I just (really) hate assholes." The evening was interesting as it was being filmed for television over the course of probably over 3 hours, with a few retakes of some songs, but hey, we weren't complaining. Mostly, I liked the idea of attending a musical event in a great seated venue with excellent sound and musicianship, and no one talking or texting or taking pictures or smoking rudely next to you, and the crowd showing great enthusiasm (even if on cue). I understand that the program itself is an hour (with commercials? ), so it will be interesting to see how they edit down the footage. I had a great evening listening to a bunch of talented musicians to whom I might not normally listen, and finally got to see a bit of Elvis Costello live. Costello is a great musician with excellent stories and knowledge to share, and I really have to see him perform properly at some point! Nice write up. However, I would add one comment and one correction. Ray Lamontagne tore the roof off with Elvis on "Henry Nearly Killed Me" prompting the audience to spontaneously give a standing ovation. Prine's sang his epic "Lake Marie". My bad, I meant to say Marie, but at 230 in the morning, my fingers somehow typed Angela. Thanks. Ray LaMontagne killed it with his version. He was on fire with his harmonica playing. I want to take this opportunity to say thanks for taking me and to complement you on a great use of "to whom." As a grammar teacher, you know I love that stuff. You know on this blog I like to keep the tone mostly conversational which means I can be fast and loose with grammar and vocabulary sometimes, but deep down inside of me is a grammar nerd, too.